User experience designers are responsible for solving real user problems. To do this, they need to empathise with their users, understand their needs, and come up with creative, innovative solutions. But how do designers continuously generate fresh ideas? The answer lies in ideation. As part of the Design Thinking process, ideation sessions help you to challenge assumptions, think outside the box, and explore uncharted territory. In this guide, we’ll explain exactly what ideation is, why it’s so important to your work as a designer, and how you can prepare for productive ideation sessions. We’ll also introduce some of the most important ideation techniques. Want to skip ahead? Just click on the links below to navigate your way through the guide. Why is the ideation phase crucial? What are some of the most important ideation techniques? Ideation in Design Thinking: What next? Ideation is the third phase of the Design Thinking process, and it’s all about generating ideas. Before we explore ideation in more detail, let’s briefly recap on the five stages of Design Thinking: Empathise, Define, Ideate, Prototype, and Test. Now, it’s important to remember that Design Thinking is not a strictly linear process. However, the insights and outcomes derived from the Empathise and Define stages (getting to know your users and setting out a clear problem statement) will guide and inform a productive ideation session. In the ideation phase, you’ll explore and come up with as many ideas as possible. Some of these ideas will go on to be potential solutions to your design challenge; some will end up on the reject pile. At this stage, the focus is on quantity of ideas rather than quality. The main aim of an ideation session is to uncover and explore new angles and avenues—to think outside the box. For the sake of innovation and creativity, it is essential that the ideation phase be a “judgement-free zone”. Ideation comes in many different shapes and sizes. We’ll take a look at some of the most popular ideation techniques used by designers a little later on. 2. Why is the ideation phase crucial? The ideation phase represents a key transitional step from learning about your users and the problem, to coming up with solutions. If carried out properly, an ideation session is where innovation thrives; it should help you stumble upon that groundbreaking solution that your users have been missing! As Don Norman explains in Rethinking Design Thinking, ideation is crucial in getting us to question the obvious, challenge the norm, and come up with new ideas. As a designer, the ideation phase is your “safe space” in which to come up with novel, perhaps unconventional, ideas. It doesn’t matter if these ideas turn out to be plausible or not; what’s important is that you venture beyond the obvious, already-been-done solutions. Ideation sessions will help you to focus on your users (as any good designer should! ); to accumulate the unique perspectives and creativity of different people, ensuring diversity of ideas; and ultimately, to innovate in ways that you never thought possible. 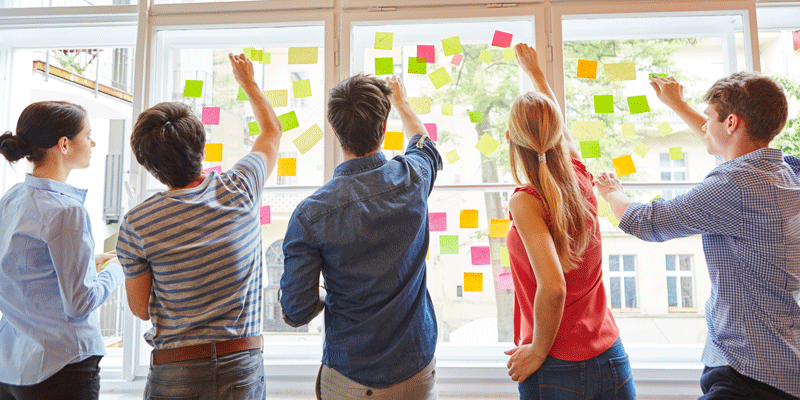 If you’re planning an ideation session or workshop, it’s important to set the right tone. Before we delve into specific ideation techniques, let’s consider how you can prepare for a successful ideation session. If you want to encourage outside-the-box thinking, it’s important to take yourself—and your team—quite literally outside of the box. It might seem like a minor detail, but the physical space in which you hold your ideation session can have a major impact. Move away from the usual setting, be it the boardroom or your desk, and hold your session somewhere completely new. A new environment introduces new stimuli, which in turn can help to trigger fresh ways of thinking. Both distraction from the problem and a relaxed state of mind have been proven to get the creative juices flowing. The best ideation sessions are those where the participants feel at ease. The ideation phase should be a safe space—but most people will need some coaxing before they feel comfortable sharing their wildest ideas. Have some ice-breaker exercises prepared to bring the group together, relieve any tension, and get people warmed up. While ideation is all about generating as many ideas as possible, it’s important to steer this process in the right direction. This is where stages one and two of the Design Thinking process come in: Empathise and Define. Throughout these two phases, you’ll have painted a clear picture of your users and their needs. You’ll also have constructed a meaningful problem statement—i.e. the challenge you need to address in your ideation sessions. In preparation for ideation, you can create a list of “how might we” questions related to your problem statement. The “how might we” methodology breaks your problem statement down into actionable segments, framing it as an opportunity rather than an obstacle. How so? Well, consider the wording “how might we…”; it suggests that a solution is possible, but doesn’t give any hints as to what that solution might be. You have enough of a focal point to guide your ideas, but plenty of freedom to think laterally and innovatively. Visit designkit.org for clear, step-by-step guidelines on how to formulate effective “how might we” questions. By definition, analogy is “a cognitive process of transferring information or meaning from a particular subject to another.” An analogy provides a comparison between one thing and another, serving as a means of explanation or clarification. What does this have to do with ideation and design? The analogy technique compares your situation—or design challenge—to something you are familiar with, enabling you to look at the problem in a new light and consider possible solutions. You can learn how to apply the analogy technique here. The bodystorming technique gets you to physically experience a situation in order to spark new ideas. If you’re struggling to get close to the problem, bodystorming is a great way to generate genuine user empathy. How does it work? You set up a physical experience resembling the problem you are trying to solve, using people, props, or a digital prototype. Based on your own interactions with, and reactions to, this environment, it may be easier to come up with ideas. Brainstorming is one of the oldest tricks in the book when it comes to generating new ideas as a group. In a brainstorming session, you verbally bounce ideas off of each other in the hopes of finding a blended solution. An alternative to traditional brainstorming is brainwriting. Instead of verbally sharing ideas, participants write down their ideas before passing them on to someone else. The next person reads these ideas and adds their own, and so the process continues until each person’s ideas have done a full rotation. All ideas are then collected and placed in front of the group for discussion. This is the more dynamic, physical version of brainwriting. Instead of passing pieces of paper around the room, the designers themselves move between different “ideation stations”. Just like brainwriting, they’ll add their own ideas before moving on to the next station. As we know, challenging assumptions is crucial to breaking conventional thought patterns and coming up with new ideas. A popular ideation technique is to come up with a number of assumptions that are inherent to your design challenge. As a group, you’ll then go through these assumptions and discuss whether they are really true, or if they’re simply there because they’ve never been questioned. In putting these assumptions to the test, you can determine what characteristics are really necessary, or which solutions could be used instead. Gamestorming is the gamification of brainstorming, and a popular technique for both ideation and problem-solving. Gamifying classic ideation methods adds an extra element of engagement and interactivity—and helps to suspend some of the normal “rules” of everyday life. You can find tips and tools for gamestorming here. Developed by Tony Buzan in 1972, mindmapping is a visual ideation technique that encourages you to draw connections between different sets of ideas or information. You’ll start by writing a keyword in the middle of the page (normally related to your problem statement). On the same piece of paper, you then surround this word with any and all ideas that come to mind. Finally, you’ll think about how these ideas are connected, depicting said connections with lines and curves—resulting in a visual map. Reverse thinking can be a fun way to flip the problem on its head and come up with new ideas. The question “how might we make our online courses more accessible?” could be changed to “how can we make it as difficult as possible for users to take our online courses?” The solutions you come up with for the reverse challenge can help you to envision what the opposite might be, leading you closer to the solution you really need. SCAMPER is an action-packed checklist that helps you to come up with new ideas for a particular product or design challenge. SCAMPER prompts the designer to substitute the topic with an equivalent or similar topic; to combine the original topic with additional information; to adjust the problem by coming up with alternative ways of constructing it; to creatively modify the topic; to put it to other uses by identifying possible scenarios where this topic can be used; to eliminate any ideas or characteristics that are not valuable; and to reverse and rearrange the problem in order to come up with a brand new concept. Storyboarding is an excellent technique for bringing a design challenge to life and exploring different avenues in a visual way. Start by drawing out your user personas—as defined in the empathise and research stages—using images and quotes to paint a vivid picture. From there, you can draw out various storylines and outcomes, visualizing how the user feels throughout. You can learn about storyboarding in more detail here. Similar to reverse thinking, the worst possible idea technique is great for putting the group at ease and removing creative blocks. Even if the ideation session has been declared a judgement-free zone, there is inevitably a certain amount of pressure to find a viable solution that your peers will like. Going in search of the worst possible idea takes away this pressure. Not only that: Reflecting on what’s so terrible about these ideas can reveal valuable insights into what a good idea might look like. When deciding which ideation techniques to use, think about the nature of your design problem, as well as the people taking part in the ideation session. It’s important to choose techniques which are suitable for the group size. At the same time, consider which methods are most likely to put your participants at ease and elicit the best response among this particular group of people. 5. Ideation in Design Thinking: What next? It may take several ideation sessions to pinpoint and refine the idea (or ideas) with which you want to move forward. Once you’ve completed the ideation phase, you will move on to prototyping and usability testing. This is where you’ll put your ideas to the test and highlight any kinks that need to be ironed out. As already mentioned, the Design Thinking process is not linear; the prototyping and testing stages may prove your ideas to be implausible after all, taking you back to the ideation phase—or possibly right back to defining the problem. When it comes to the ideation phase, just remember: Have fun, experiment with different techniques, and don’t be afraid to think outside the box!